My best knitting buddy can meet for play dates on Tuesdays and Fridays; those are the days she doesn't work, because she has her three-year-old son. Her husband has him on Wednesdays and Sundays; her mom takes care of him (in exchange for her board in a fancy tiny house they built for her) Mondays, Thursdays and Saturdays. Two other moms I know work Tuesday, Wednesday and Thursday; their husbands work on Saturdays so they only need daycare two days a week. My sister's friend is living with her in exchange for 30 hours a week of care for her baby girl. As for me, I juggle freelance writing work with my husband's Army Reserve duty and sustainable landscaping work so we only pay for child care when we're out for a rare date. We're not alone. Everywhere in the U.S., parents are looking at the high costs of full-time child care and choosing to opt out; or at the very least, cut back to a few days a week, or half-days, to save money. The Wall Street Journal today reports a spat of layoffs and falling enrollment at child care centers around the country; yesterday's Oregonian spotlighted struggling preschools. When hours are reduced or the mortgage payment gets steeper (or, more likely in many cases, the credit crunch means you have to live within your means); child care becomes a luxury, not a necessity. 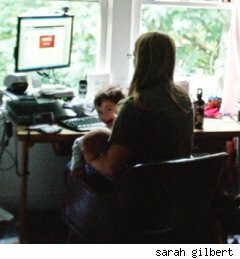 The WSJ points out how many parents are working from home with young children present (I type this as my two littlest boys play trains in the living room; I know!) and suggests parents should not take children out of group care altogether (it's good for their development) and try to not get too stressed out (your emotional communication impacts children as much as your verbal communication). Easier said than done. The story also details "an elaborate three-generation scaffolding of relatives," hard on grandparents, who often must work, as well. While the idea of child care as a luxury may seem ridiculous, finding quality child care is indeed a first-world struggle. In all but the upper-middle class, child care is the responsibility of family members and neighbors; in many family-run businesses, it's common to see the young children behind the counter and the older ones helping with the work after school. If our economy is, indeed, in a prolonged downturn, I predict full-time child care will be a perk that only the wealthiest two-income families even consider.